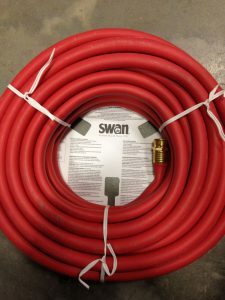 When you purchase a new garden hose it comes with some really long twist ties. Forget those little things that come on your bag of bread, I’ve seen some over a foot long. Save them. This new garden hose has three very long twist ties that I will save for many future handy uses. Twist ties can even be used to hold, well, twist ties. 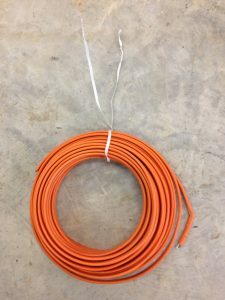 Long twist ties are worth having around for organizing all kinds of things around the shop, from wires that need arranging to those little flags AT&T put all over your yard when they ran your new phone cable (and cut the TV cable with the Ditch Witch). 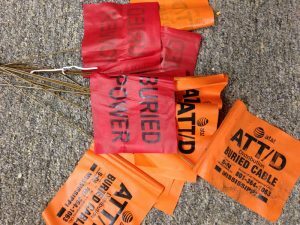 Don’t ever throw these little flags away, they can be so handy! Once, I needed to dig a winding drainage ditch. Nature had already shown me the path the water wanted to take. To accommodate its natural tendency, and make sure I didn’t go off course, I put flags in the ground on that natural path to make it completely clear where I needed to dig. Not only is there no point in buying flags, but when the time comes that you need them, you won’t want to have to stop what you’re doing to go to the hardware store. This big roll of electrical cable could be wrapped with two zip ties joined together. but there is no need to waste those expensive little buggers. One of these (free) twist ties will go around the whole thing. 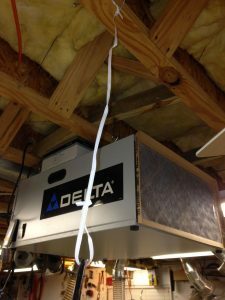 Maybe you need to temporarily hang a power cord from the ceiling. 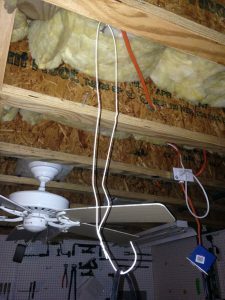 Loop and twist around a screw in the ceiling, then loop and twist around the cord. Problem solved! 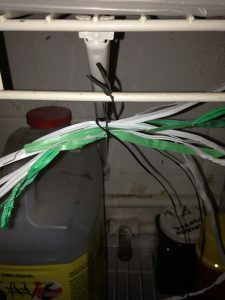 If the cord is too heavy for a twist tie, use a coat hanger. Stretched out straight, one end can go on the ceiling screw, the other around the cord. For a more permanent solution, like this outdoor spot where I do a lot of sanding, I’ve used screw hooks permanently installed in the joists of the deck overhead. 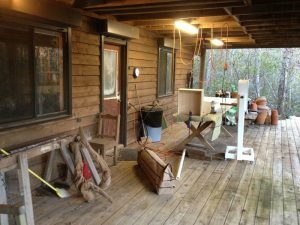 I can manage an entire 100-foot extension cord with none lying on the table in my way. And, when you just need a little encouragement, nothing fills the bill like a pelican. 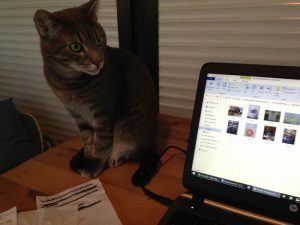 In the absence of a pelican, a cat like Max makes a great stand-in.